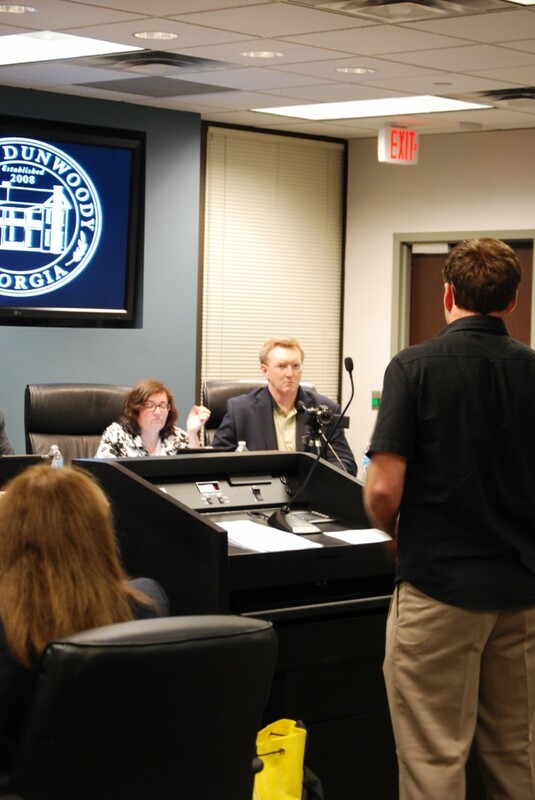 A representative of Treetop Quest, LLC addresses Dunwoody council members Lynn Deutsch and John Heneghan. Photo by Lauren Ramsdell. As Dunwoody matures, it’s still living with the growing pains of establishing itself as a new city and all that it brings, including zoning ordinances, a 911 center and private-public partnerships. Here are some of the highlights from the May 12 meeting. • Dunwoody will select the firm to conduct the search for its new city manager. Mayor Mike Davis said that after seven firms expressed interest, the field has been narrowed to four. Davis said the final firm will be chosen by May 16. • Rebecca Keefer presented several proposed wording changes to City Code Chapter 16 – Land Development and Chapter 27 – Zoning. City councilors agreed to consider “flexibility” in zoning for residences, such as potentially increasing the amount of added living space that would then trigger a sidewalk in front of a home, from 10 percent currently to perhaps 20 percent. Currently, a location becomes approved for food trucks after a truck applies for a permit. A sign is then set up at the location for 30 days prior to the truck’s stop. Councilors are considering amending this requirement. “A sign is more intrusive for 30 days than a food truck is for 3 hours,” said Councilman Doug Thompson. • The council will consider renewing the city’s contract with the Chattahoochee River 9-1-1 Authority, or ChatComm, for the next few years. Despite citizen complaint, councilors and acting city manager/police chief Billy Grogan said that ChatComm provided reasonable service. “Going back to DeKalb is not an option,” said Grogan. • Also discussed was the potential for a treetop obstacle course run by the same company that runs Treetop Quest in Buford. Representatives of Treetop Quest Inc. demonstrated how platforms will be attached to trees, harnesses, and explained their vision. The company is applying to use several acres of trees at Brook Run Park. The company representatives said that they would handle construction, staffing, and security, and would provide $25,000 or 5 percent of revenues to the city annually, whichever was greater.